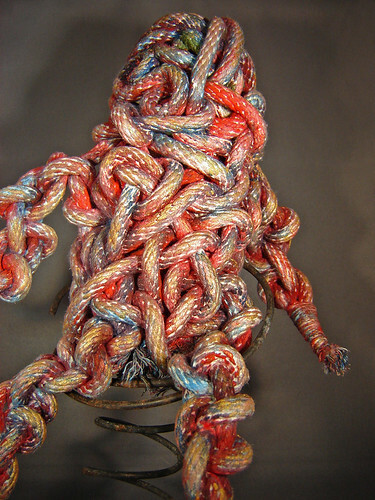 Detail of rope knotted figure I completed in 2000. This was a traumatic time for me, and I was in art therapy. Yes, its supposed to be disturbing and frightening…if you see it that way. The limbs are flexible, and the ends are wrapped in string. No glue, or sewing was used in this figutre. Figure is a bit over 12 inches tall . It was difficult to paint the cotton rope but I used a dry brush to sponge and stipple the paint on. I used metallic acrylic paints in gold, pearl, pink, and blue, as well as a non metallic red.